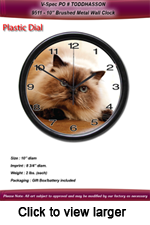 We offer the largest selection of wall clock cases in the industry. These are ideal for the home hobbyist, professional crafter, gift maker or for industrial and commercial uses. All of our wall clock kits are shipped unassembled. They are easy to assemble and have built in hangers for mouting. Each kit includes a wall clock case, lens, clock movement, hour minute and second hands as well as a white Arabic dial as shown. The dial can be used as is or reversed to the blank back side and decorate as you desire. We take great care to ensure that your final product looks the way you are expecting. With all custom orders we send a Virtual Spec PO for your review before we move forward, and once it is approved we will finish your order. Click on the image to the right to see an example of a Virtual Spec PO. In addition to these wall clock kits we also offer full service printing, assembly and boxing for corporate and other volume customers. Call your ISI sales representative for more information.